The Hall of Gods Slot is a five reels slot with 20 paylines and comes from Net Entertainment. The game theme is based on the Norse mythology and of course it’s about gods landing here on your reels. 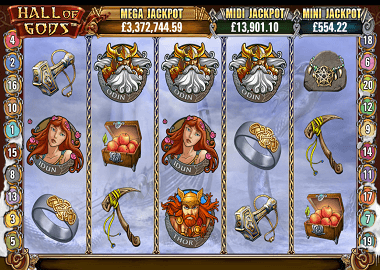 The Hall of Gods has several well known bonus features like Wild Symbols and a Free Spins feature. You can also win three progressive jackpots here (Mini, Midi and Mega Jackpot). This makes spinning on the reels even more exciting! You can play the slots on all devices including iOS and Android smartphones, tablets and desktops. The minimum bet is only 20p and up to £ 50 you can bet per spin. Symbols and Payouts: The Hall of Gods slot has only theme related symbols. This includes a number of gods as well as some tools and objects from this era. The low paying symbols are a box of red apples, a pickaxe, an armlet, Thor’s hammer and a ring. With the hammer symbol you can win 100 times your bet for 5 symbols and with the ring 120x your bet. The gods Idun, Loki, Freva, Thor and Odin are the high paying symbols. Thor and his father Odin pay the highest profits. With the Thor Symbol you get 2000x are your bet and with the Odin symbol even 4000x your bet with 5 identical symbols. Free Spins feature: Of course, the Hall of Gods Slot also has a Wild Symbol (the Dragon) which replaces all other symbols except the Scatter Symbol. The Scatter lands in the form of Odin’s raven on your reels. If you get at least three raven symbols you trigger the Free Spins feature with 10 Free Spins. With 4 raven symbols there are 15 free spins and with 5 raven symbols 20 free spins. In Free spins feature, three or more scatter symbols activate additional spins. During the free spins all wins will be multiplied x3! The multiplier doesn’t ‘t apply to bonus game winnings. Jackpot Bonus Game: The Free Spins feature gives you the biggest rewards of the Hall of Gods itself. But you can really get rich after you trigger the bonus game. Then you can win one of three progressive jackpots. You will receive the bonus game if you land three shield / hammer symbols on your reels. Within the mini-game, you’ll use Thors Hammerto’s break the shields on the screen. Behind it are cash prizes and the jackpots hidden. The higher your stake, the higher your chance to win a jackpot. The mega jackpot has the highest level of more than £ 1 million in the pool. The Hall of Gods slot is not the visual masterpiece of Netent. Nevertheless, the slot has its charm, because with the free spins as well as in the bonus game beckon very good profits. You can play the slot here for free on our site. Click on the Hall of Goods banner above. You can also find other free Netent Slots like Ghost Pirate Slot, Asgardian Stones or Finn and the Swirly Spin here. Recommended UK online casinos with a large selection of Net Entertainment slots and other providers are the Casino Cruise, Spinit Casino or Genesis Casino. In all the casinos you get a welcome bonus and at least 200 free spins.